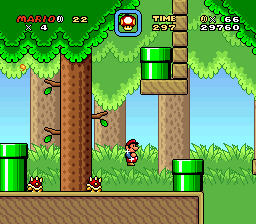 Super Mario Bros: The Early Years - A slightly SMB1-like hack - Beta now available! 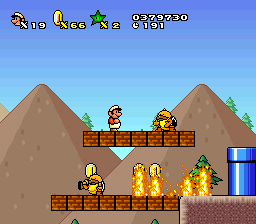 Forum Index - SMW Hacking - Works in Progress - Super Mario Bros: The Early Years - A slightly SMB1-like hack - Beta now available! Let the power of my words sink into your soul. Hey Gamma V, try putting the main map music value as 00 and see if it works. 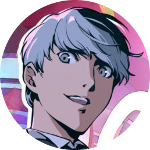 In case it doesn't, I can provide you a fix, since I made a little uberASM code for myself that allows variable custom music in a same submap depending on certain stuff. I'd just need to do a little tweak, but that won't take any long. If you mean for me to try setting it to 00 in Lunar Magic, I tried that once. It did nothing but cause the previously-playing song to continue. I am using UberASM on the Overworld for HDMA gradients. Apparently, that's not what's bugging up the music-loading on the now-split main map. I set up a new ROM and installed every bit of ASM BUT UberASM, but the same thing happened. 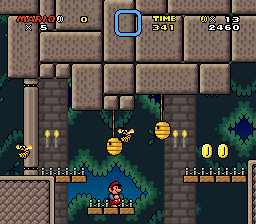 I checked my other patches for writes to $1DFB and only found them in the SMB1 Flagpole patch, in which they're kinda necessary to make the level clear fanfare play. 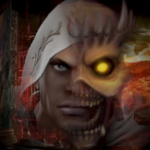 UPDATE: Thanks to Kaizoman, the issue with the Submap Split Patch's music loading has been fixed. Now I can move on and finish this hack, starting with 4-1. 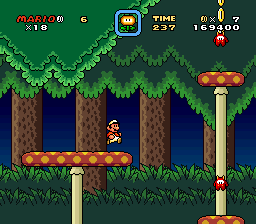 This is pretty much your average forest level. Expect plenty of Wigglers and hostile plantlife. There are also Lakitus hanging out in some of the pipes, and they're all too happy to pop out and toss a Spiny at you. Since I still felt like working on levels after finishing 4-1, I went ahead and built 4-2. Hope you're not afraid of bees! 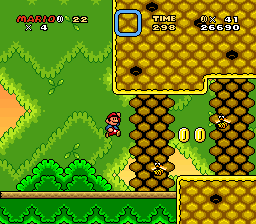 The fat bees are reskinned Thwomps. Some slam downwards. Some slam upwards. Bees will fly out of holes in the walls like this every couple seconds. Time your moves carefully. 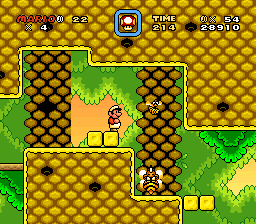 That bees level looks fantastic, Gamma. Keep it up! BOOYAH! Also, any links to drawings or stuff I could've posted here have been put down. This looks super nice, honestly. 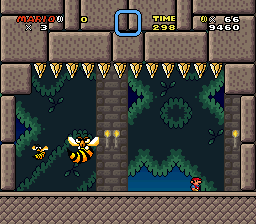 That one bee-themed level in SML2 has always been one of my favorites, so seeing you "modernizing" it is really cool. 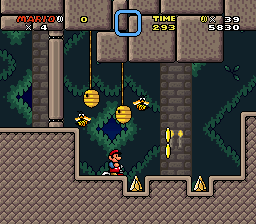 This level really looks nice. Level Design seems fine aswell. But the choice of music is... odd? Unfitting? I would suggest a more upbeat and funky theme. Interesting level and graphic swaps, though I also noticed the cutoff and agree that the music used in 4-2 seems rather unfitting. And since I didn't comment on 3-3, 3-4, or 4-1 either...3-3 seems fine, but I don't have much to say about it. 3-4 looks to be well put together and well decorated. 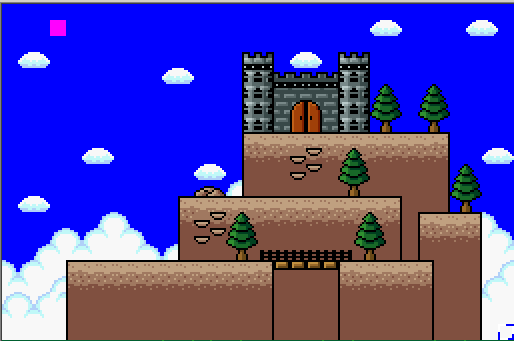 4-1 also looks pretty all right, though I'd be careful about having too many foreground-obscuring trees. 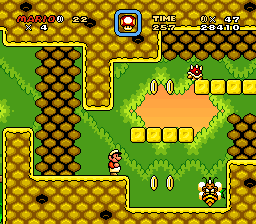 The music section doesn't have a "beehive" tag, and the SMB1 underground was probably the closest approximation to the sound of the SML2 beehive stage's theme. I could try using Honeybloom Galaxy. I am actually thinking of a calm yet somehow upbeat and happy song. But I can't really give you an example. They're all BOUNCY mushrooms! Whee! Even Ninjis love to bounce on them. I wanted to comment about 4-2 as well. This might be a bit cliche, but I would recommend the music from the beehive levels in Donkey Kong Country 2, I think it a would be very fitting. 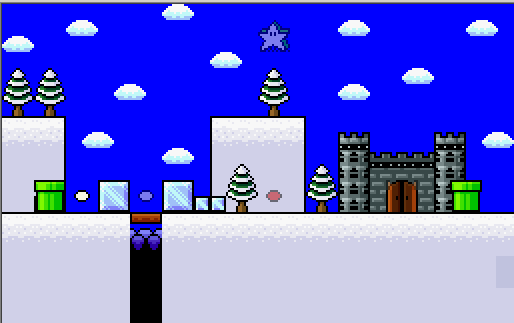 Although to me the level looks strange having a background that is vastly different from the foreground. 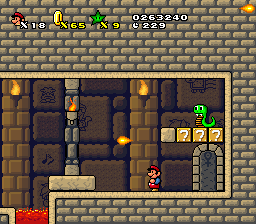 Maybe go for a cavern type background? Just my opinion though. Excuse me. Do you know where this music is from? It's about Super Mario Reborn 5 and pipe city 1. 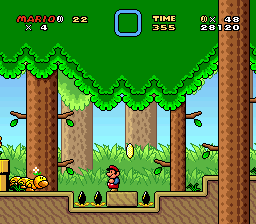 I originally considered drawing a cave-like background, but decided to just reuse the foliage from 4-1's background because this beehive is in a tree. 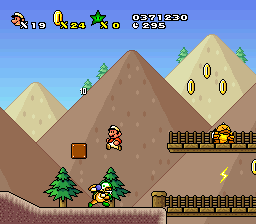 Also, Flight of the Zinger seems like it wouldn't be "Mario-like" enough. Since World 4 is almost done, I decided to go ahead and put together World 5's map. I kinda like the flat style you're using here, it works pretty well with the more linear style the hack seems to follow. 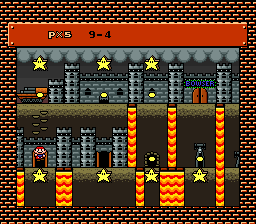 I think some of the decoration doesn't look too good, though (specifically, the rocks and the climbing stones under both the rock and the castle). Not much to comment on 4-3, it's a solid level overall. 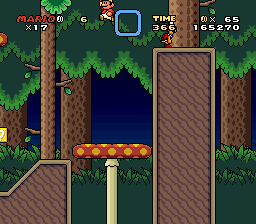 Only nitpick I have is how the camera doesn't follow the player, considering how high they send Mario. It would be great if you made it work when you land on the higher mushrooms at the very least (the one around 0:26 is a nice example). 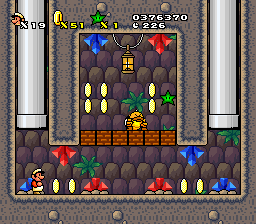 Also, you probably already noticed it, but there's a poorly placed bouncing Parakoopa around 1:10 that dies pretty much instantly, you should move it back a bit. 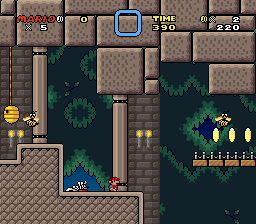 @Gamma V: Nice use of the Mushroom Hill Zone Act 2 music for World 4-3! Now it's time to storm the World 4 Castle! There are also wooden spikes. Here's the reason there are so many bees in the castle. The boss is a huge bee. Here's the World 5 Map in-game. Woah! 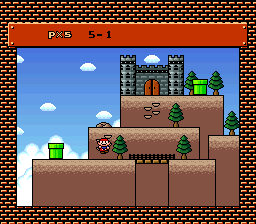 The World 4-Castle looks cool! I love the bees, too! Keep it up, Gamma! BOOYAH! How about a sneak peek at the World 9 Map? 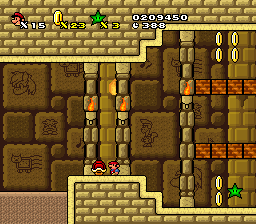 I'm a long way from starting the levels for it though. I still have to do Worlds 5 through 8. Time for a Double Post! 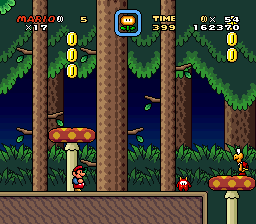 Thanks to Erik557 and imamelia, I now have a custom Status Bar that works with the alternate Yoshi Coin counter I'm using for Green Stars and is Layer 3-friendly. I finally drew a proper boss door for 3-4. That's not all though. I also finished 5-1. Chargin' Chucks make their debut here, as do Sumo Bros.
That Sumo Bro. 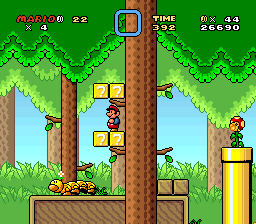 would love to keep Mario from getting his Green Star.